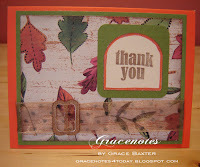 For this card I used Fabulous Finds and Alphalicious cartridges. This is my first attempt at making belt buckles. They're a lot of fun to do. You can stack them as thick as you want. I used bronze metallic paper, then inked the edges with bronze ink to cover the white layers and make them match the face layer. I cut buckle 4 at size 1. Size 1-1/4 was just too wide for the size of this card and the 1-inch ribbon I wanted to use. The arched frame was created by cutting slide holder 1 with the feature "windows" on. Inside, I used a computer generated Bible verse on the top panel. For the bottom inside panel, I cut braces from the Alphalicious cartridge at size 2. 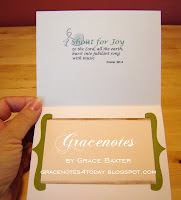 The cream-coloured writing panel is cut to fit inside the green braces and edges are inked in bronze.